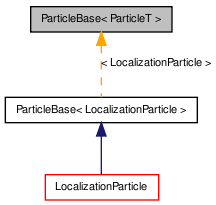 Provides a common base class for particles used by the ParticleFilter. Each particle represents a hypothesis regarding a position in state space. The state space being modeled is defined by the fields tracked by the particles, a sensor model which evaluates the 'health' of each particle based on incoming information from the world, and a motion model which updates particles based on the robot's own changes to the world. For a common example, see the LocalizationParticle for tracking a robot's position and orientation in a 2D world. The final requirement of the ParticleFilter itself is to provide a sumSqErr() function so that a confidence interval can be computed. However, the meaning of the value returned by this function is entirely up to you. The base class provides a prototype for the function, but its implementation is abstract. Definition at line 40 of file ParticleFilter.h. Definition at line 43 of file ParticleFilter.h. Definition at line 45 of file ParticleFilter.h. This is only used to compute the confidence of the particle filter, you may want to weight some dimensions differently if they tend to have smaller values or are more important. How you interpret ParticleFilter::confidence() depends on how this function is implemented. Generally weights are indicative of probability, but are often unnormalized since the normalization factor is constant across particles and thus doesn't affect matters of relative comparison. Definition at line 68 of file ParticleFilter.h. Referenced by CameraShapeEvaluator::computeLikelihood(), operator<<(), LocalShapeEvaluator::updateWeight(), and ParticleFilter< LocalizationParticle >::weightLess().